Be prepared for poor lighting conditions. 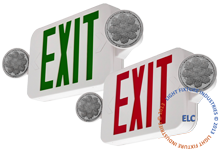 Emergency Exit Lighting is critical in a fire emergency or power outage. In a fire, visibility may be limited due to smoke and flames. During a power outage buildings can become very dark and extremely difficult to navigate. Emergency Lighting provides visible building exit locations guiding people quickly to an exit in an emergency event. Speak with a D-Blaze representative at 336-629-3300 or Contact Us to request additional information. A combo unit is an exit sign with emergency lights attached. 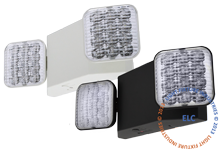 These combo models are the perfect solution for installations requiring both an exit sign and an emergency light. Emergency combos feature an LED exit sign with side-mounted emergency lamps. The exit sign portion of the unit is illuminated at all times. The emergency lamps come on only when AC power to the building is lost. The advantage to emergency exit sign combo models is that there is only one unit to maintain, one electrical connection to hook up, and one battery backup system to monitor. No one wants to be in the dark in an emergency situation. Our emergency lights will automatically engage in the event of power loss helping to ensure a clear path to an exit. The primary purpose of emergency lighting is to illuminate exit routes but it also illuminates other safety equipment. Functioning emergency lights could be required to comply with state building and fire codes. In an emergency situation, an Emergency Exit sign can save lives. 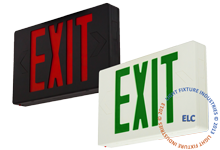 D-Blaze, Inc. offers LED exit signs that comply with building fire codes and insurance standards. Contact D-Blaze today and let us help you decide on the Emergency Exit, Emergency Lighting, or Emergency Combo unit that is best you. Request a Quote or call us today at 336-629-3300.